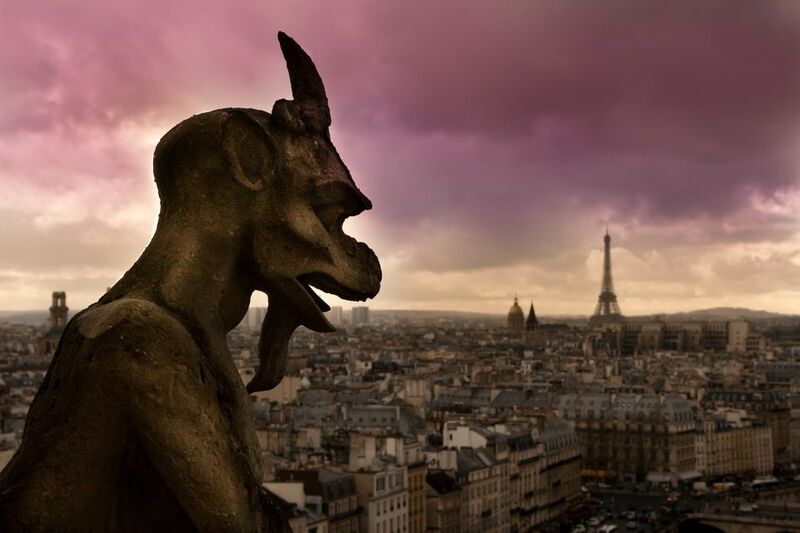 If you're hoping to celebrate Halloween in Paris, you may be in for some disappointment. Halloween is not as deeply rooted tradition in France as it is in the U.S., Canada, and Ireland. Instead, it's a recent import that seems to be driven by enthusiasm among young kids eager to get their hands on candy (and an equal measure of weary acceptance from parents). You won't see many elaborate decorations, spirited Halloween parades or hordes of adults gleefully regressing to childhood in the streets of Paris. However, if you're determined to summon the spirit(s) of Halloween in France, there are still ways to get ghoulish this October. Here are a few ideas. Halloween at Disneyland Paris is probably the easiest way to satisfy kids' Halloween fantasies In 2018, the entire theme park will be made over for Halloween throughout the month of October and through November 4th. It's "A Spooky Mouse Skelibration." Meet and greet some of the most nefarious Disney villains. Watch Mickey’s tricks as he steals the show on a fabulous new float in the wickedly wonderful Halloween Cavalcade. Disney Characters parade along the streets of Disneyland Park in eye-popping autumn attire. Adults can have fun too. Try dressing up and hitting a Halloween party at one of the city's clubs this year. 2018 Halloween parties in Paris range from a Halloween party at the Aquarium to costumed dancing at the Nouveau Casino. The list is in French, but try not to be daunted-- you can click on the event title for locations and contact details. You can also use Google Translate. All Saint's Day, or "Toussaint" in French, is a solemn, peaceful holiday commemorating the dead on November 1st, the day after Halloween. At Père Lachaise cemetery, Montparnasse Cemetery or Montmartre Cemetery, a long stroll among the flower-decorated graves is a more culturally authentic way of marking the season. You might also want to pay a visit to the Paris Catacombs, an ossuary holding the bones of six million Parisians that was created at the end of the eighteenth century to relieve overcrowded cemeteries. Again, you're likely to run into disappointment if you're hoping to take the kids trick-or-treating. Parisians rarely stock up on candy to hand out to children on Halloween. Even if they do, it's likely to be allocated exclusively for the children who live in their own building, since most people live in apartments protected by one or more door codes. What to do if you don't want your kids to miss out on trick-or-treating then? You'll probably have to be inventive. Buy some candy yourself and hide it around the hotel room, or have your kids dress up and go for a walk around the city, inventing spooky stories about the old sites you come across. You can elect to do something quirky, weird, and creepy to get into the Halloween spirit: try spending an odd afternoon at one or more of these weird (and often disturbing) Paris museums, then check out the strangest and quirkiest shops in Paris, peddling everything from taxidermied animals to wax figurines. For even more ideas on staking out what's odd, creepy, and fun in the city of light, we recommend Manning Leonard Krull's spirited website documenting the weird and unusual in the city of lights, Cool Stuff in Paris, which has an entertaining and helpful guide to Halloween in Paris. Krull's a true expert on all things Halloween, so we highly recommend sifting through his entertaining suggestions. Finally, if you can't make it to Paris for the holiday but are looking for some seasonal inspiration, read our in-depth guide to 10 Strange and Disturbing Facts About Paris. Happy Halloween!